A woman who exists to guard the bonfire at Firelink Shrine and to serve the player. She has lost her light, and wears a crown which covers her eyes. In one of the game's endings, the Keeper held the First Flame in her hands just like when the Witch of Izalith finds her Lord Soul. Image comparison here: http://imgur.com/a/CpV69. Fire Keepers at least in this most recent period are blinded, judging by Erina and the numerous Fire Keeper corpses found in the tower behind Firelink. That and Ludleth describes her as being held captive to the flame similar to the player. The most important piece of evidence is the Fire Keeper Eyes which you can give to the Keeper. We're warned that they show images seen by the very first Fire Keeper, things that no Fire Keeper should have to see. And when you give them to the Keeper herself she's put in a state of shock, describing a world of darkness but with countless faint lights off in the distance. And should the player choose the End of Fire ending, both you and the Keeper are gradually enveloped in a darkness like the Abyss. Except it's not the Abyss. The Abyss is hostile, nightmarish. Entering the Abyss without the Covenant of Artorias in DS1 kills you. Manus's Chasm of the Abyss is home to freakish black sprites of Humanity that may have been actual people at some point, and I always assume the presence of physical ground there was due to the player stopping Manus and its spread before it got any worse. And in DS3, Wolnir is consumed by the Abyss when you destroy his bracelets, and almost immediately in fact. The darkness that comes with the End of Fire feels more natural and peaceful, and with the promise that light and life will continue. The Keeper can still talk even after you can't see her, after all. Not only that; even though the fire goes out like it did in DS1's ending, the Primordial Serpents don't show up to celebrate you as the new Dark Lord. The Usurpation of Fire ending is the one that feels Dark Lord-y, especially since you're doing it at the behest of Yuria and Londor, who are in turn apparently working for Kaathe. 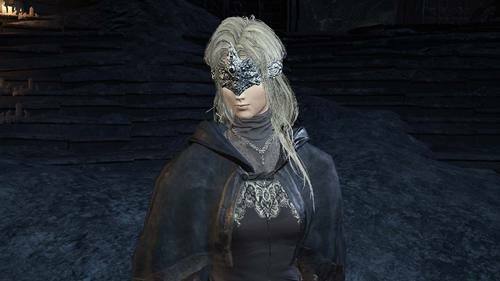 The Eyes are said to also let the Keeper see images of betrayal, and at first I thought that this "betrayal" was Gwyn's betrayal of the natural order by linking the Flame. The Fire was supposed to fade, and when it would it clearly wouldn't cause everything to fall apart. But there is also the Witch's attempt to create a second Flame, an attempt that spiraled out of control, birthed the Bed of Chaos which in turn would create demons, and generally made life even more miserable. Either of these events could have been witnessed by the first Fire Keeper, and along with visions of what SHOULD have come into being after the Age of Fire, the images of all the bad brought about by linking the Flame or birthing the Chaos Flame would bring a crisis of faith to any Fire Keeper. And sure enough, the Keeper decides to help the player decisively snuff out the First Flame if they wish for it. And if you read the "betrayal" like I do, then this makes the Fire Keeper extinguishing the Flame an act of atonement. And who better to atone for all the death and misery brought through prolonging the Age of Fire than the first person to try to prolong it in the first place? An overall decrease in damage based on the user's Sin level, determined by how many NPCs killed and hosts killed whenever you invade a world with a Cracked Redeye Stone. And all things considered, the Witch's sins are still going strong during the time of DS2, even if the Bed of Chaos was destroyed. There are plenty of demons still active, and the Old Chaos is at best contained with what is presumably its most powerful champion, the Burnt Ivory King, slain. But by the time of Dark Souls 3, demons are on the verge of extinction as evidenced by the item description of the Stray Demon. The Demon Ruins, likely the very same ruins from DS1 as evidenced by the presence of Black Knights, has been cleared out and the Ghru have taken over, and with the death of the Old Demon King, there really might be no more Chaos Demons left anywhere. For as bad as things are in Lothric, demons and Chaos aren't serious problems. The world isn't suffering because of the Witch of Izalith's "sin" anymore, so if she were to be reborn yet again, would she still be subjected to punishment like the Lost Sinner was or would she be granted the chance at doing something more productive? The Demon Ruins also hold two separate items fashioned from hairs of different Daughters of Chaos: a whip made from black hairs and a talisman made from the Fair Lady's white hair. Take Quelaag into account and red hair's represented too, so clearly the Daughters of Chaos don't all have the same hair color. But the Keeper's hair is also white and we never see the Witch's own hair in the introductory cutscene, so it's possible. Just as viable though for someone to argue that the Keeper's the reincarnation of the Fair Lady, especially since the Lady was also a Fire Keeper. Lastly though… there is the issue of Aldrich. Aldrich explicitly devoured Gwyndolin, and furthermore has attacks corresponding to the other DS1 gods. Priscilla's Lifehunt Scythe attack, a halberd reminiscent of a Gravelord Servant sword, and sorceries like Gwyndolin's (but possibly also a reference to Seath, since Gwyndolin's abilities are already referenced with the bow and arrow attacks). The odd god out is the Witch if Izalith. Yes fires are exhibited in the second phase of the fight, but that could just be Aldrich drawing on his Lord of Cinder powers and making reference to Gwyn just like Yhorm, the Abyss Watchers, and Lothric. Aldrich and the return visit to Anor Londo as a whole raise a lot of questions about what can be can be considered "established canon" in Dark Souls 1 and there's no in-game explanation for Aldrich using a Gravelord Halberd (whereas at least the Lifehunt Scythe could be drawn from Gwyndolin thinking about Priscilla while being eaten), but the reincarnation theory does help account for this because it means that Aldrich could've just devoured Nito's own reincarnation in this era. He's called the Devourer of Gods, after all. By all rights you should need to eat two gods to get that "s" at the end of your title. We can even chalk Oceiros up to being a representative of Seath in a way (carrying on his knowledge) or even throw him out entirely since Seath was not a proper Lord Soul bearer, and Gwyn is very much a part of the Soul of Cinder. "Welcome to the bonfire, Unkindled One. I am a Fire Keeper. I tend to the flame, and tend to thee. The Lords have left their thrones, and must be deliver'd to them. To this end, I am at thy side." "Produce the coiled sword at the bonfire. The mark of ash will guide thee to the land of the Lords. To Lothric, where the homes of the Lords converge." Then touch the darkness inside me. “Welcome Home, ashen one. Speak thine heart’s desire." "Ashen one, to be Unkindled is to be a vessel for souls. Sovereignless souls will become thy strength. I will show thee how. Ashen one, bring me souls, plucked from their vessels…"
"Ashen One, may the flames guide thee." Then touch the darkness within me. Take nourishment from these sovereignless souls." retreating to a darkness beyond the reach of flame. casting themselves upon new forms." "Ashen one, may I pose thee a question? Has the little Lord Ludleth spoken to thee of any… curious matters? Of a thing once most precious, or most terrible, now lost to the Fire Keepers. Pray tell, is it a matter of which I should be apprised?" "… Ashen one, are these… Are these eyes? How gracious of thee, ashen one. The very things we Fire Keepers have been missing." "Ashen one, my thanks for the eyes thou'st given. But Fire Keepers are not meant to have eyes. It is forbidden. These will reveal, through a sliver of light, frightful images of betrayal. A world without fire. Ashen one, is this truly thy wish?" Selecting "Wish for a world without flame"
"Of course. I serve thee, and will do as thou bid'st. This will be our private affair. No one else may know of this. Stay thy path, find lords to link the fire, and I will blindly tend to the flame. Until the day of thy grand betrayal." "Of course not. Please, kill me, and take these eyes away. Before I am drawn into the darkness. seduced by the thin light, and the awful betrayal." "…Ashen one, if thine heart should bend… kill me, and strip these eyes from my person. I will return as the Fire Keeper I once was. As it is has always been." hen let it find its own place, within my bosom. But know'st thou not I cannot die. So please Ashen One, allow me to serve thee." Worn by the guardian of the shrine. The Fire Keepers were robbed of light, to better serve as vessels for souls. Only those who cherish the writhing, searing darkness were given the keepers' black attire. Soul of a Fire Keeper who is said to have returned from the Abyss. This Fire Keeper preserves the bonfire, and serves its champion. She is said to have soothed and accepted the dark sigil, which has tainted her soul. And yet, her soul will one day embed itself in the bosom of another Fire Keeper. A pair of dark eyes. Said to be the eyes of the first Fire Keeper, and the light that was lost by all Fire Keepers to come. It reveals to the sightless Fire Keepers things that they should never see.